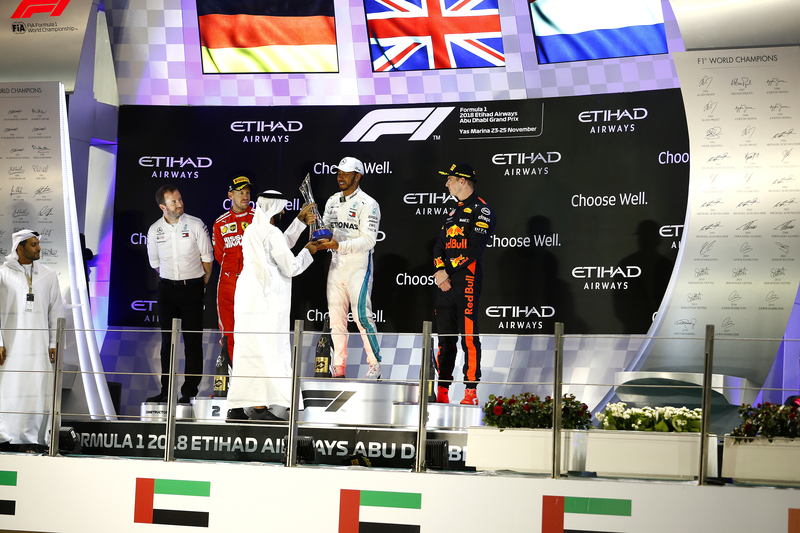 Yas Marina Circuit, Abu Dhabi, 25 November 2018: Lewis Hamilton took his 11th win of the 2018 F1® calendar and sealed his fifth championship winning season in style at the FORMULA 1 2018 ETIHAD AIRWAYS ABU DHABI GRAND PRIX on Sunday evening. In a thrilling race that started with an-all Mercedes front row, Hamilton battled hard for the win, keeping the Ferrari of Sebastian Vettel and the Red Bull of Max Verstappen at bay in the closing laps as the sun set on Yas Marina Circuit, the 10th edition of the Abu Dhabi Grand Prix and the 2018 season. During the biggest Abu Dhabi Grand Prix weekend to date that earlier saw the F2 and GP3 seasons end with George Russell and Anthoine Hubert being crowned champions in the respective support series on Saturday, the F1® 2018 season finale saw Mercedes yet again finish on top going into the winter break – their fifth victory in 10 years at the Circuit. Waving to his fans from the top step of the podium, Hamilton was in great spirits as he closed the calendar in Abu Dhabi on a high note. Al Tareq Al Ameri, CEO of Yas Marina Circuit, said: “Congratulations to Lewis on winning this race, what a fantastic end to the 2018 season. I would also like to offer my thanks to all the teams and drivers for supporting us during our 10th edition Abu Dhabi Grand Prix weekend and making this special event one to remember. “Again we have seen a wonderful four days of entertainment all over Yas Marina Circuit – from the excitement of the F1, F2 and GP3 series to the varied activities and entertainment in our F1® Fanzone and Oasis areas, and to our four nights of A-list music artist at our After-Race concerts. Another sell-out crowd of 60,000 people were treated to a full-day of sporting action and entertainment on a sunny but cool Sunday at Yas Marina Circuit. In addition to the support F2 and GP3 Series getting proceedings of to an exciting start on Sunday, off-track a range of activities in the Circuit’s F1® Fanzone and four Oasis areas kept race goers of all ages entertained with driver autograph sessions, race simulations, aerial acrobatics displays, live music performances, UAE cultural displays, and much more. Just before the race, two new liveried aircraft from Etihad Airways and Fursan Al Emarat performed a stunning UAE national colours fly past, followed by the UAE National Anthem. At exactly 5:10pm it was time for the main event, the three-way F1® showdown that began in Qualifying yesterday between Valtteri Bottas, Lewis Hamilton and Sebastian Vettel. With the setting sun providing the perfect starting backdrop, the 55-lap Abu Dhabi Grand Prix ended under the illumination provided by the Circuit’s iconic floodlights, ended with Lewis Hamilton jumping for joy at a Circuit he has won at twice before. Fans watched the action live from Yas Marina Circuit’s multiple grandstands and from fans’ favourite Abu Dhabi Hill, while millions of others around the world followed live updates and a wealth of multimedia content on the Circuit’s online channels. The evening finished with a show-stopping performance at the du Arena as global rock icons Guns N’ Roses entertained the crowds with Sunday night’s Yasalam After-Race Concert. Their high-energy performance wrapped up an A-List line-up of After-Race concerts throughout race weekend that included Post Malone on Thursday, followed by hip hop artist The Weeknd on Friday, and UK singer Sam Smith on Saturday. You can relive the highlights of the FORMULA 1 2018 ETIHAD AIRWAYS ABU DHABI GRAND PRIX on Yas Marina Circuit’s dedicated YouTube Channel, YasTV, as well as the Circuit’s social media channels.